The seasons have turned in many places already and the BBQs, patio furniture, and sun umbrellas have been broken out of storage. What I look forward to the most is sitting around on my decks, taking in the surrounding landscape and enjoying the long light of evening as it turns to night. Our health is very closely related to our mental perceptions, and the calming relaxation of sitting on the deck does more than just make us feel happy- so it’s no wonder we are naturally drawn to creating an outdoor living space to enjoy! 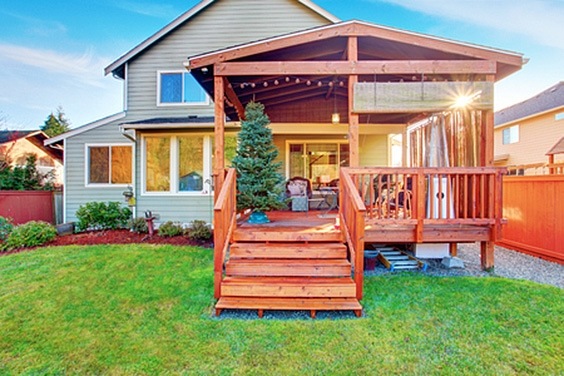 Most people take advantage of their yard when they have a place to relax, and decks are the perfect solution to a relatively maintenance free area of enjoyment. 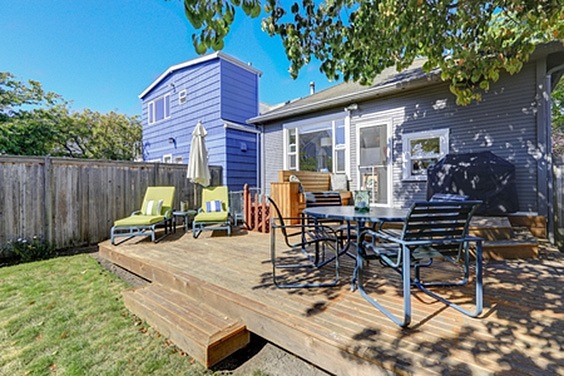 If you don’t have a deck yet or are looking for some new ideas, look no further. 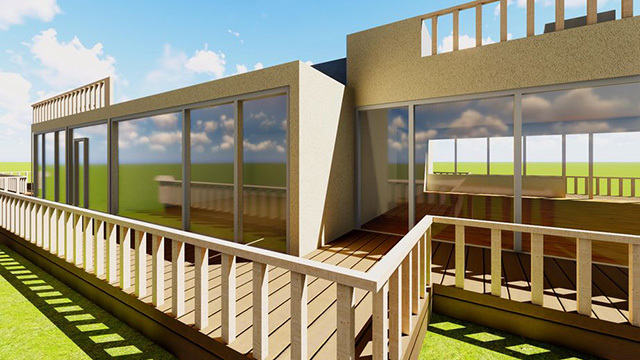 The following provides you with a series of deck design ideas in all shapes and sizes, and one is sure to fit your needs! Not all wood is created equal. 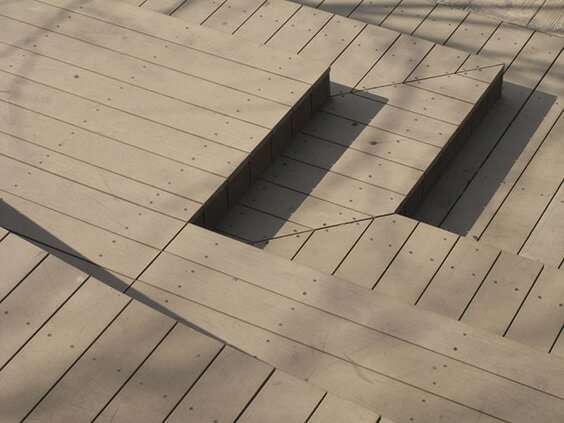 Wood deck design standards are in the eye of the beholder. Different types of trees yield different colors and durabilities, wood grains and natural stains. 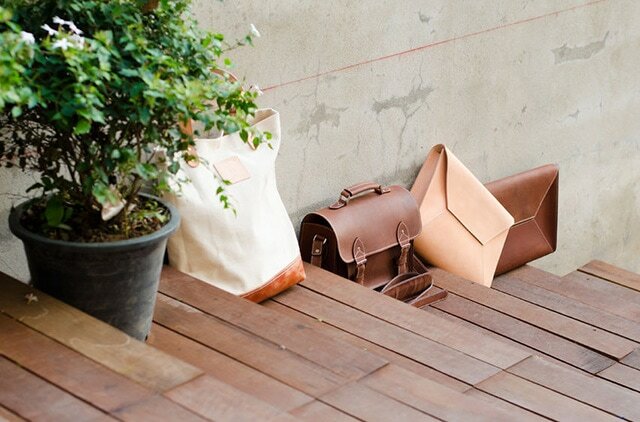 Plus, it is easily incorporated into any sort of setting- from modern clean lines to more rustic cabin hideaways. 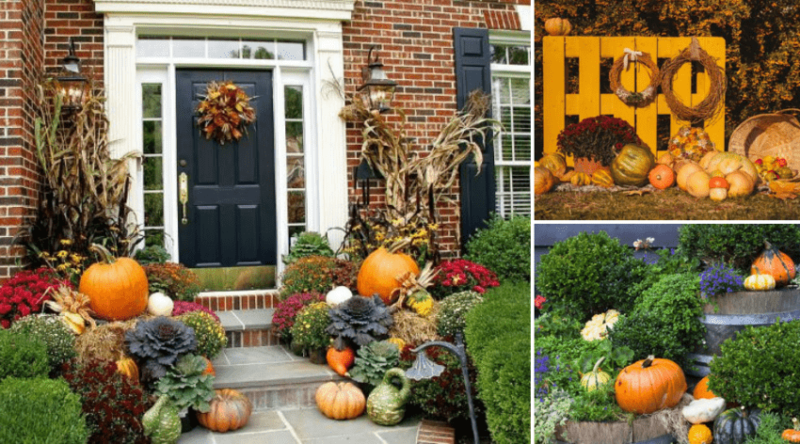 Also consider your surrounding environment and landscaping to incorporate visual appeal. Don’t be afraid to mix and match wood grains, shapes, and color stains, or use wooden furniture upon wooden backdrops. 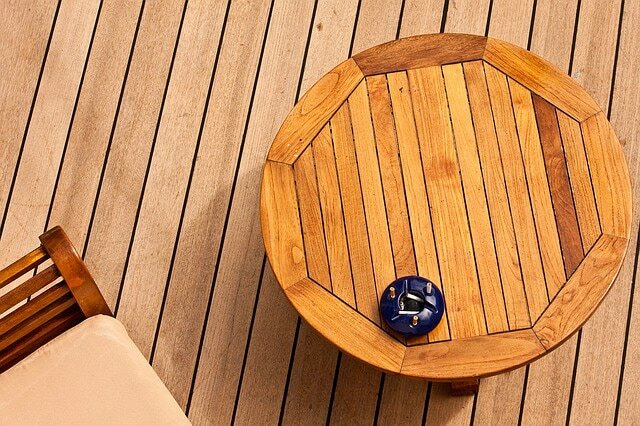 Let the long lines of your boards bring it all together like with this fun table and decking design. All too often our ideas of hybridized indoor/outdoor sitting areas take on the familiar materials of the house. Instead, make your space a true deck experience complete with side rails which can be easily viewed through the weatherproof windowpanes. Don’t cut your decking short just because you ran out of ground. Instead of taking the time and money to level out a surface, build your decking out and provide a dramatic overlook to the landscape below. Decks truly are an extension of the architecture of your house and double as the perfect outdoor living spaces, especially for socialization. This simple design utilizes the lines of the house to provide an extension of the building and a private place to mingle. 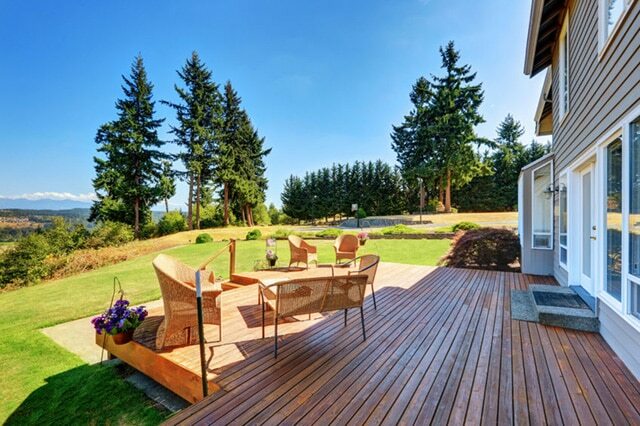 Large open yards are only emphasized by the natural woods used in deck designs. Balance out your tree line with the colors and shapes a deck provides and relax as part of the nature you are surrounded by. 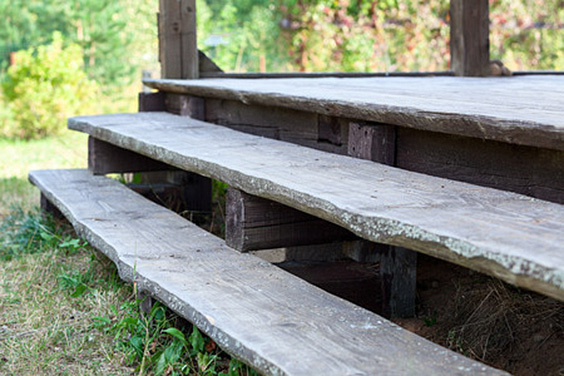 Don’t limit yourself to wooden planks when planning out your dream deck. 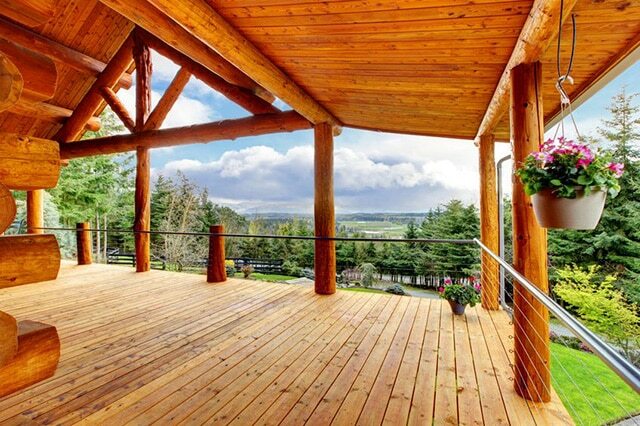 Use the natural shapes and colors of pine logs to help define and blend log cabins architecture and modern decking lines for the perfect outdoor retreat. Old fashioned red brick is such a classic material to side your house with, and the colonial feel is such a perfect compliment to the wooden hues of this deck stained to match. 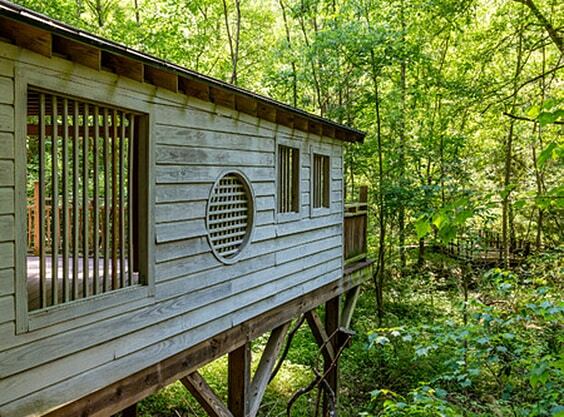 Tree houses are all the rage as either permanent dwellings or guest housings. And what is a house built amongst the trees without a little bit of their own mixed in? 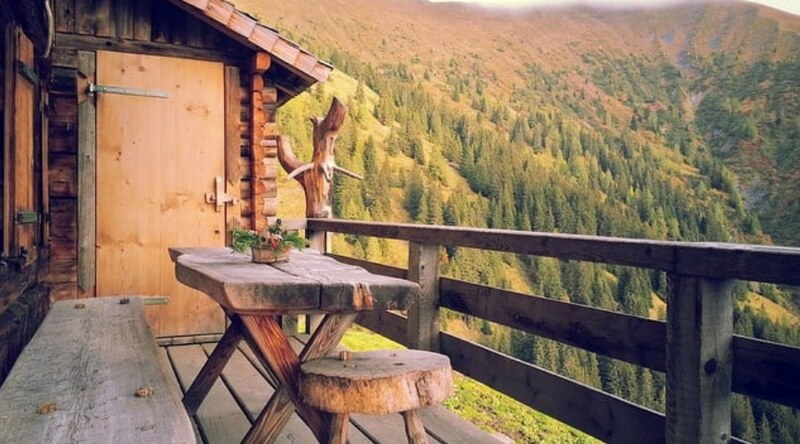 With a little innovation, you can create the perfect vista overlooking the forest. Contrasting colors and lines help define this poolside sundeck design. Get rid of the boring concrete or patio tiles and replace it with the natural wooden tones that will only add additional interest through the years. 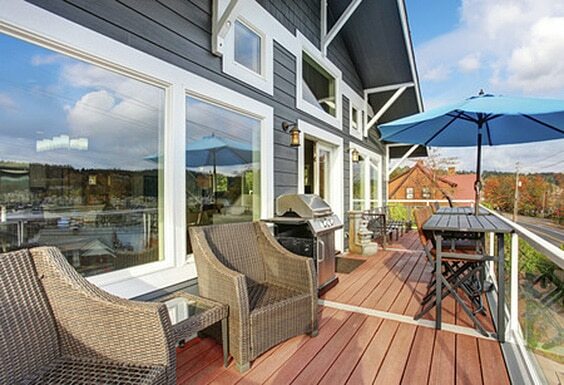 Just because you are an urban dweller doesn’t mean you can’t enjoy the comforts of a traditional decking experience. 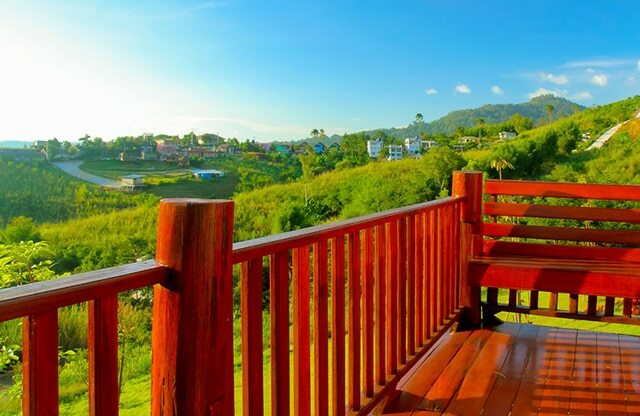 Take advantage of your views and balconies to add wooden flooring as the illusion of a breathtaking deck overview. 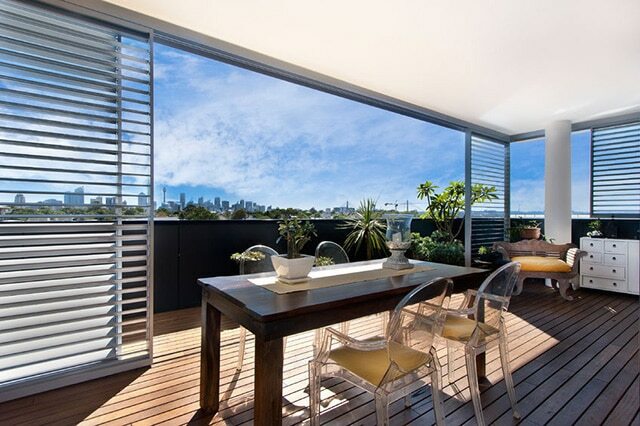 Clean modern metal and glass lines meet the linear wooden decking in an outdoor dining area. Many people eschew wooden decks in more modern architecture, but the mix of materials often emphasizes the beauty of art this style mimics. This wooden deck perfectly matches the natural tones of the coastal land across the bay to create an illusion of water meeting land in this carefully constructed poolside design. 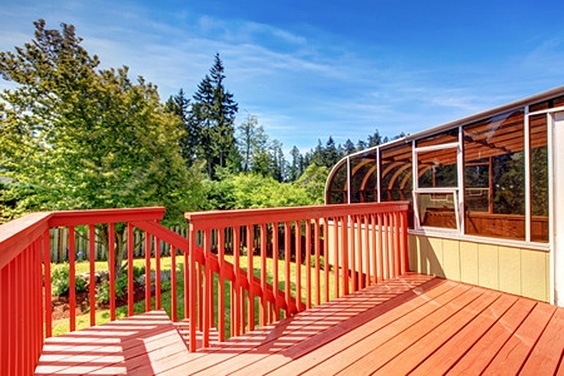 The epic deck incorporates covered dining, a wraparound effect, and a relaxing walk down complete with overlook. 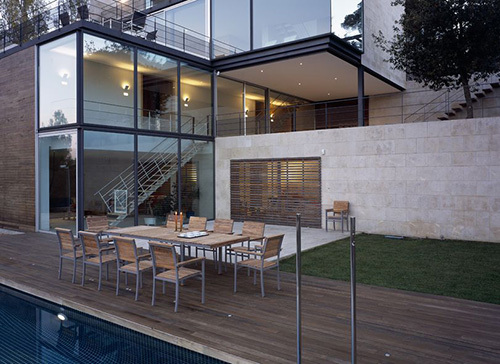 This truly is the definition of incorporating an exterior living space to your home. 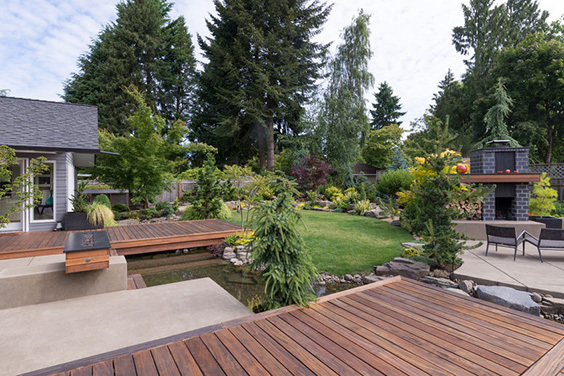 Take advantage of the backyard you have and integrate your landscaping directly into your decking design. This koi pond serves as a perfect introduction before exploring the rest of the eclectic interests your yard may yield. 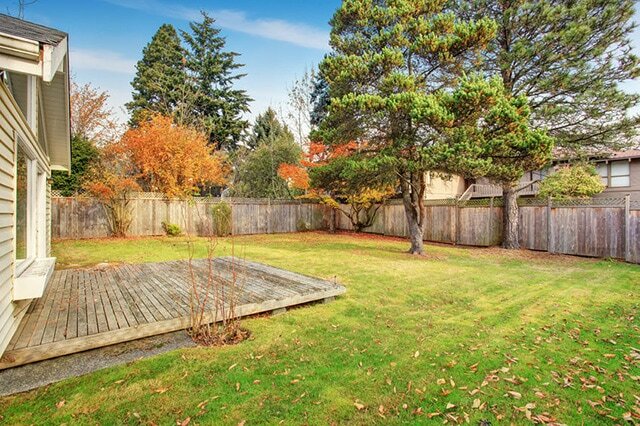 Cut back on how much lawn you have to mow and build a wooden walkout to enjoy and utilize instead of a patio. 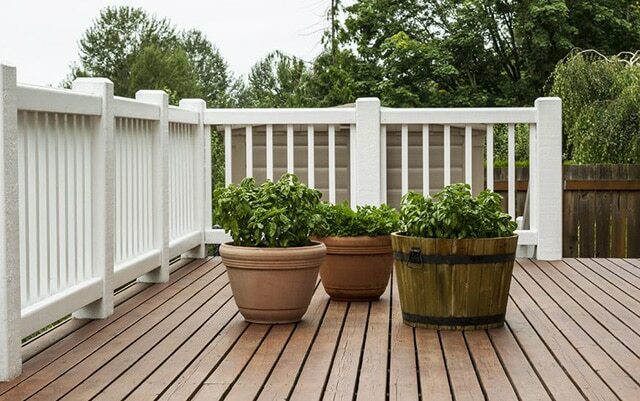 Decks are so much more visually appealing and often increase your home value! You don’t have to have to limit yourself to small spaces. 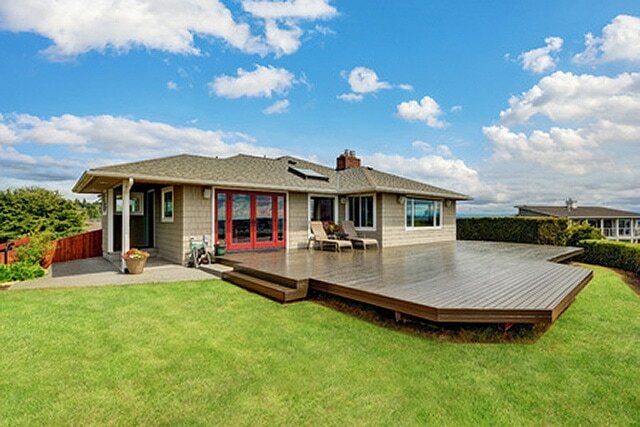 If you feel your deck may be too confined, consider taking it to another level, in a different direction, or both! 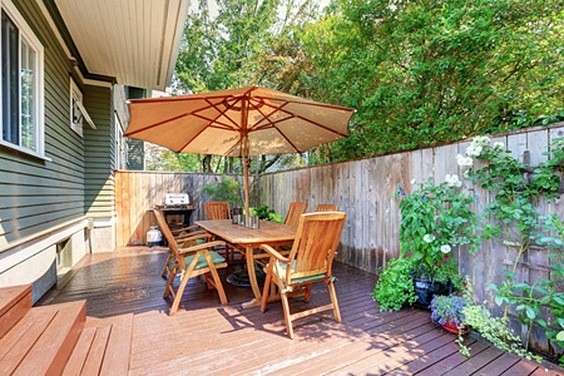 This narrow space was perfect for a small deck, but the owners refused to be constrained! 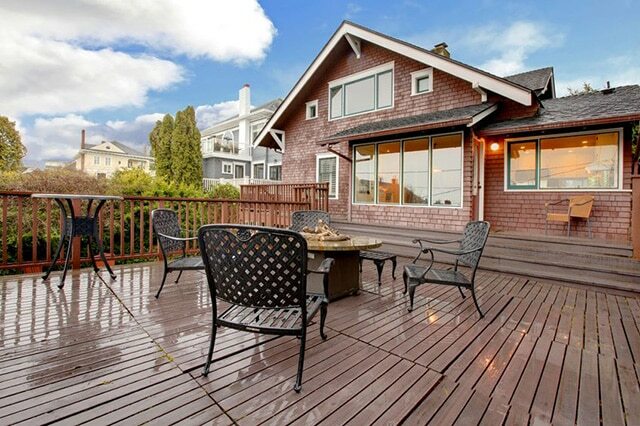 If you can’t decide between a deck or a patio, why not do both? 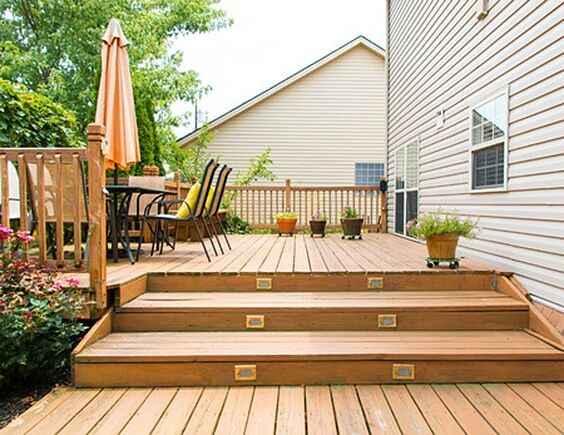 This deck serves the perfect walk out from the main living space, but also allows for yard utilization and a protected space for any season grilling! Again, this serves as a perfect example of how decking can be used to highlight modern deco design. This deck extends the straight lines and sharp edges of the house to help create an illusion of the indoors being out against the large, windowed walls. Right up to the beach that is! 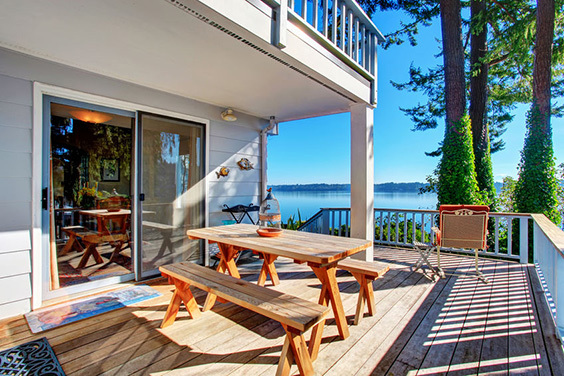 Instead of dealing with all the dry sandy discomforts the beach can bring, why not extend your deck and bring the lake right to you? 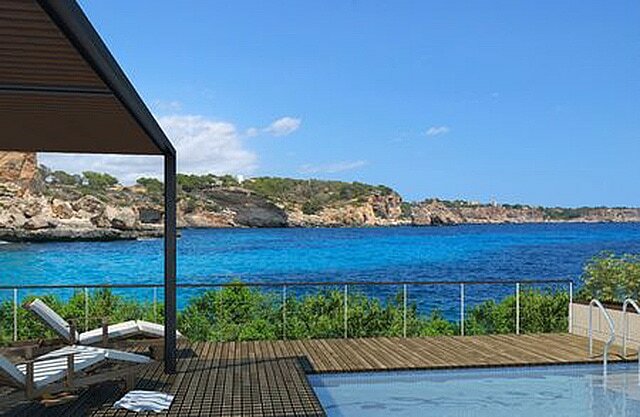 Overhang decking is the perfect solution to the long walk down to the water! Who said your deck had to be all one piece? Integrate your deck into your landscape to provide unique sitting areas surrounded by the many designs and textures you choose to incorporate. 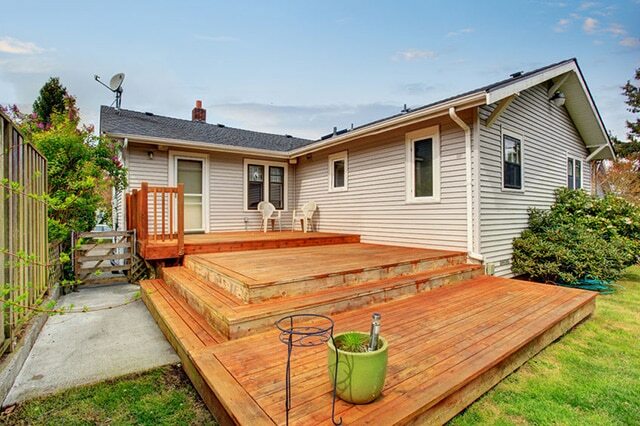 Just because you don’t have a large yard doesn’t mean you can’t have a deck. 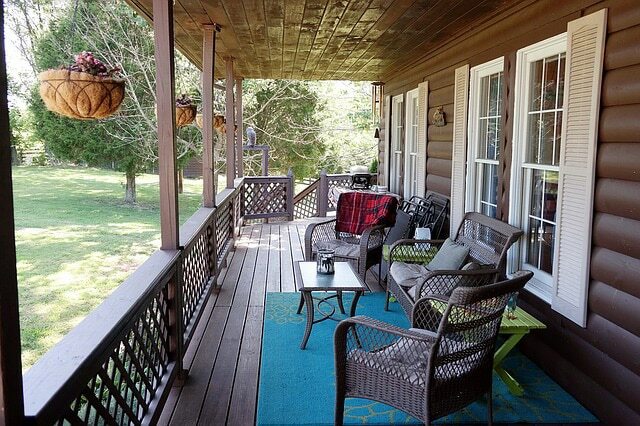 Small decks provide just as much tranquility as a large one. 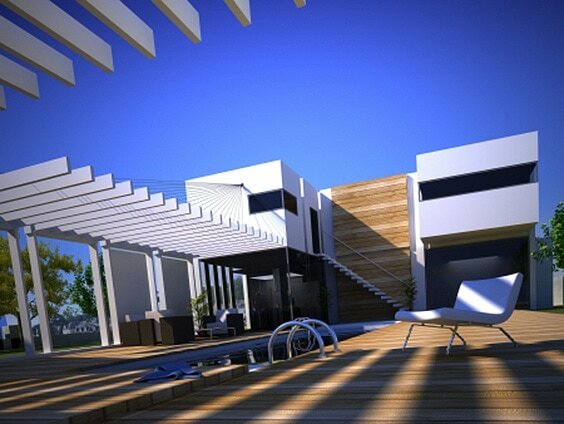 Consider multilevel decks, or even upper-level balconies to enjoy the view and provide a relaxing outdoor escape. Rustic mountainside retreats are often small and cozy, but that doesn’t mean they can’t have a decadent deck. Take advantage of gorgeous vistas and build a feasible, yet comfortable outdoor viewing area. 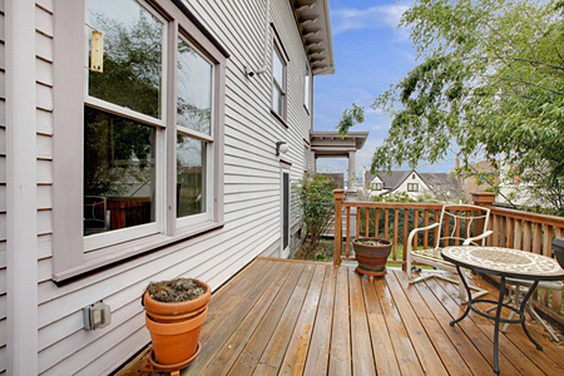 Small backyards shouldn’t dictate your deck dimensions. Flower gardens take part in the overall landscape as part of a potted selection of color and vegetation to help transition the size of the deck into the surrounding beds. 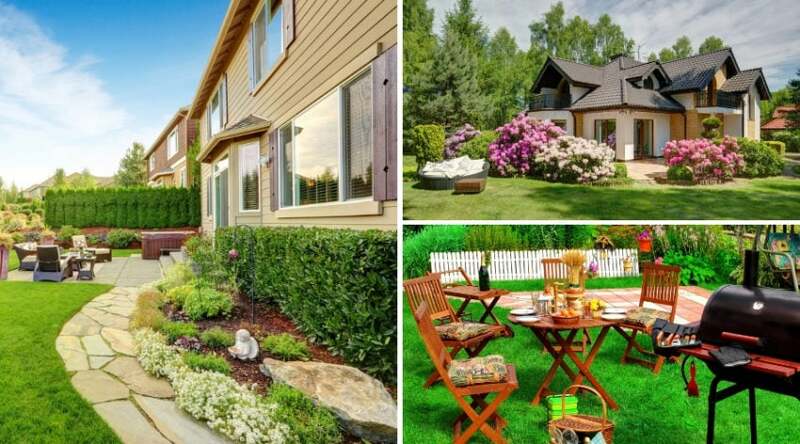 Don’t let those tiny spaces between houses in subdivisions go to waste. Utilizing what you have can have surprising results, and provide a new degree of privacy and comfort even when living in close quarters. City yards don’t have to limit your scope of landscaping design. This combination of raised and ground decking provides an illusion of depth, especially when the wooden boards are incorporated into the privacy fence. Add in some climbing plants and nobody will know your neighbors are only a stone’s throw away! 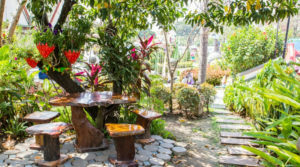 Small spaces can be fun to landscape, but often difficult to move around. Using up your narrow areas with a deck alongside privacy fences provides you with the feel of country living, and keeps out prying eyes. The biggest perk? You don’t have to mow the lawn or pull weeds! 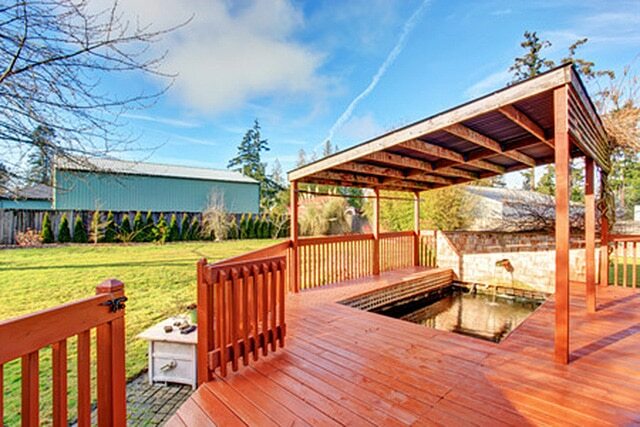 This awesome little covered deck is the perfect outdoor hideaway without cutting too much into the overall landscaping. Complete with curtains and lighting, this is a great design that can be utilized year round. 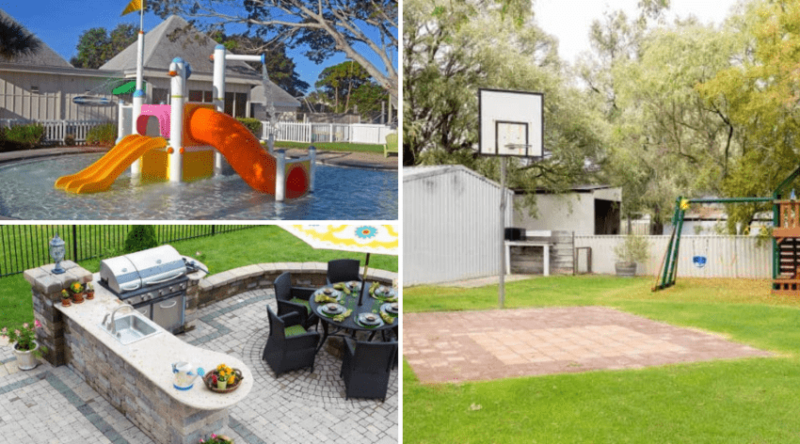 All too often our suburban backyards lack the space we want. Build your deck wide along the length of your house rather than into your backyards to take advantage of the extra living space it provides. 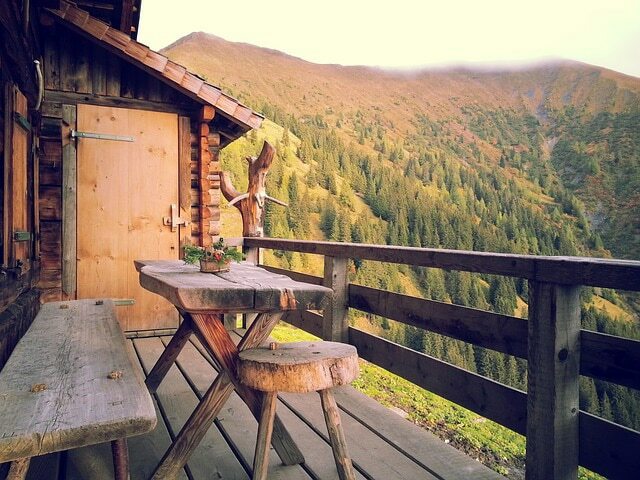 Just because you have neighbors, it doesn’t mean you have to give up on the surrounding views. Take your deck a level (or two) higher and above some of what blocks you from the beauty of the area you have chosen to live in. Instead of building out and over your sloping vista, cut your deck short as your land begins to slope and give an illusion of infinite spaces. This deck incorporates a concrete patio as contrast against the manicured lawn to help frame the mountainous horizon. If you’ve ever lived where there is regular rainfall, then sometimes it can be difficult to really enjoy the backyard when everything is a consistent soggy mess.Decks are the perfect solution to not having to wait until everything dries out. 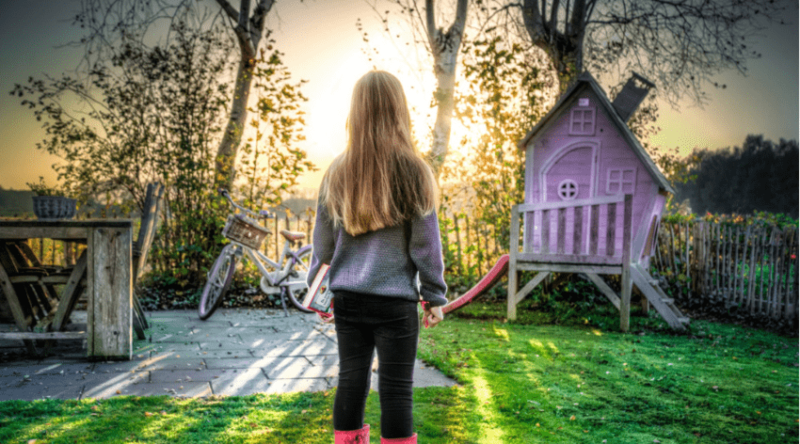 They are set higher than a patio that can form puddles, but still low enough to enjoy the yard uninterrupted once the lawn won’t have you leaving footprints behind. 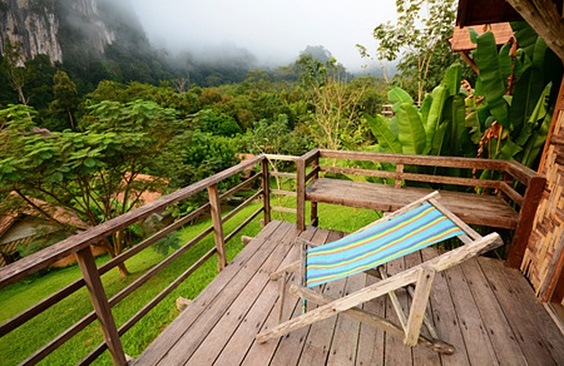 Decking truly can provide an entirely new perspective for your surroundings. 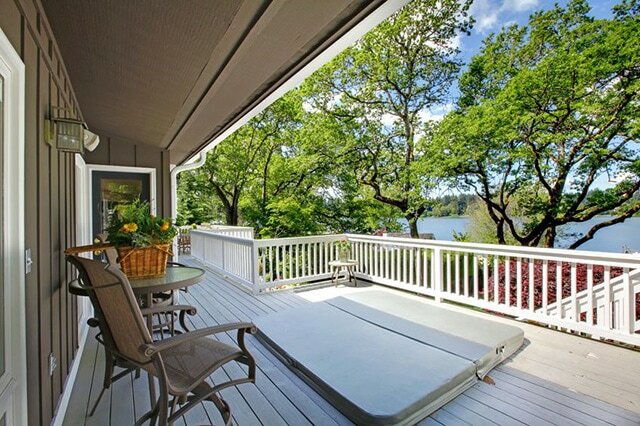 Small walk out decks is really awesome when treated as balconies to provide a new view. Think of them as an escape away from reality. 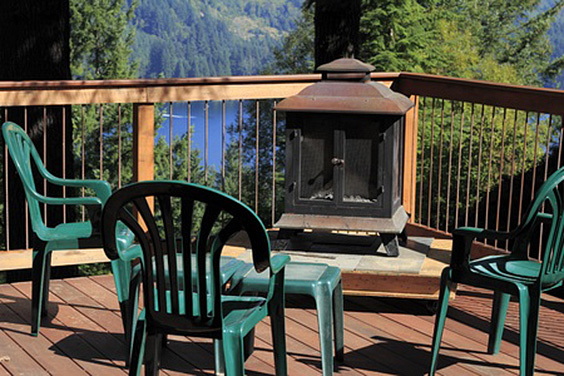 Many decks, especially those of any height, have the subsequent railing for protection and further aesthetic value. Take advantage of the many materials and shapes that complement the wood you are using to create a unique contrast. Colors and materials mix and match to create a stark contrast against the surrounding woods. Darker colors wouldn’t provide the elegance this white railing suggests, and wouldn’t stand out well against the darker vegetation. Lattice is always a fun way to bring a touch of the old-fashioned to life, especially when applied to a large wrap-around deck. Match your outdoor furniture in both design and color for a further eclectic appeal. Closely placed vertical decking slats provide a stark contrast against the horizontal siding of this two-story home. Taking advantage of the upper walkout and the way the house has utilized the hillside to create a multi-level dwelling, this design helps balance the overall effect of the building design. Contrasting white provides a dramatic backdrop against the planters on this backyard deck. Just as you can mix and match your materials, you can do the same with your colors. 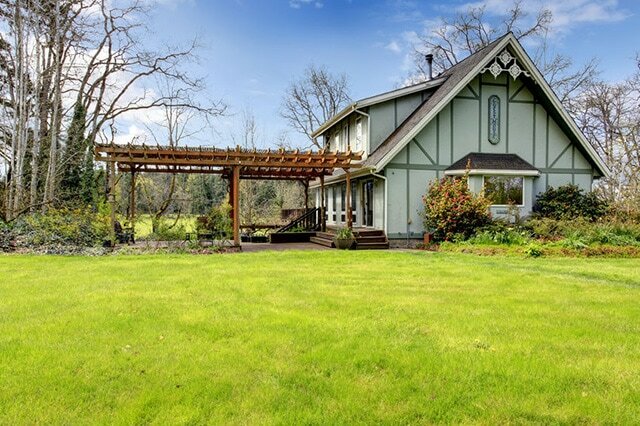 Keep it simple so as not to draw away from the landscaping of the yard. When your horizon is filled with the natural greenery of vegetation and towering trees it makes sense to bring a little bit of that into your immediate living area. Natural posts, hues, and placement allow the eye to wonder naturally into the surrounding landscape when taking in the views of this upper-level balcony. 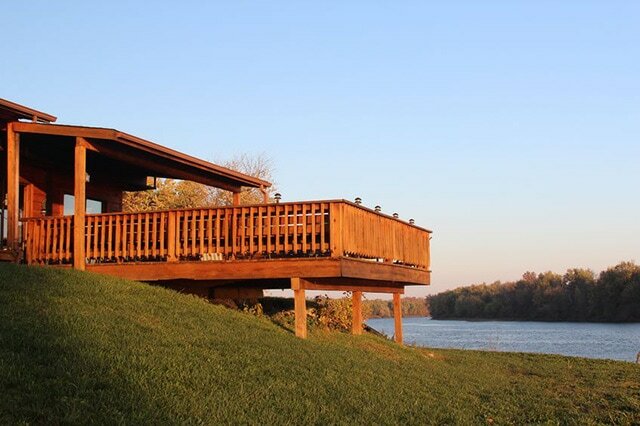 Decks often mimic the straight lines of their housing counterparts, but just because most wooden materials are angular in shape doesn’t mean you can’t provide some natural curves. This large upper-level walkout adds further interest through a curvature around the housing walkout, providing an elegant appeal. Recreate the essence of the piazza with wooden decking cut to mimic wrought iron deck railings complete with streetlight ambiance. This outdoor bistro seating captures perfectly the elegance and romance of the streets of Europe. 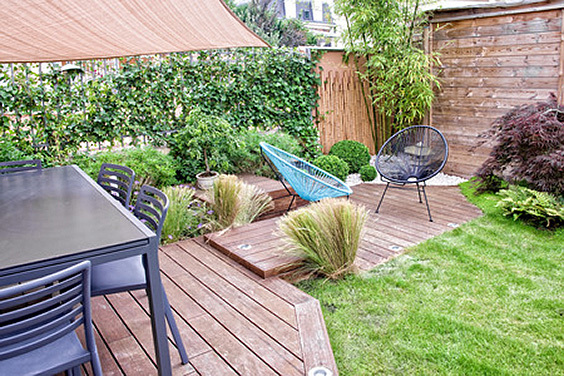 A wooden rail tops this contemporary open terrace space surrounded by the sleek, thin lines of galvanized steel wire. Decking rails and the deck itself provide a natural contrast against the gray hues used to match the furniture as an effortless blending of materials. Metal and wood are yet another set of materials that surprisingly mix well together. Smooth wooden rails frame wrought iron bars to create a blended, more open feel to this raised deck overlooking the surrounding vista. Not all decking needs a stairway, but if you are looking to access your property from the outdoor living area you have created, then make sure to consider placement and visual value. Long stairways can be doubled back upon themselves and provide sitting areas from one level to the next. 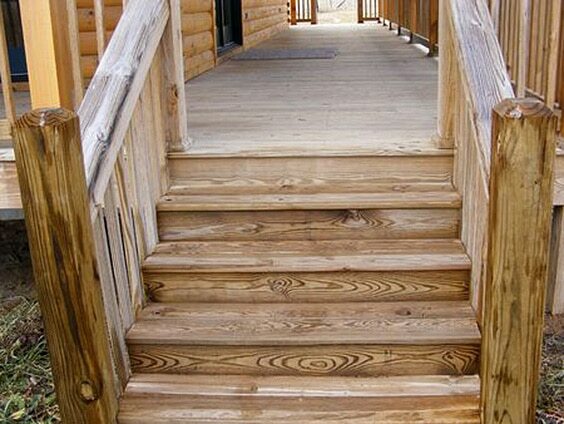 Shorter walk ups may provide deep steps and depth to your decking design. Whatever you choose, have fun creating the look you desire. The geometric design of this non-conformative stairway is further compounded by the placement of the decking boards. Puzzle like in nature, it is truly a unique, art-inspired piece that would look well in both contemporary and classic decking designs. Embed lighting into your family decking and light the way each evening for little feet and nighttime company. 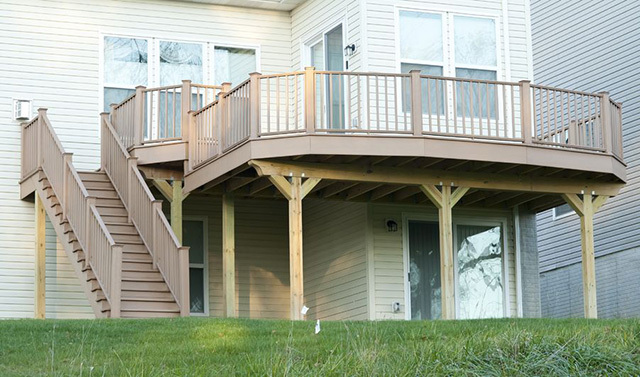 This multi-leveled deck provides a wide stairway and helpful built-in lighting for climbing convenience. 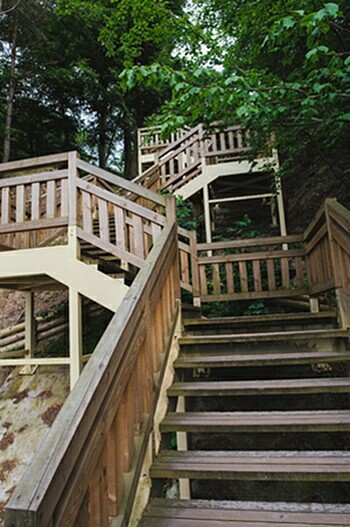 Long meandering stairways lead up (or down) the hillside to explore the world around you. 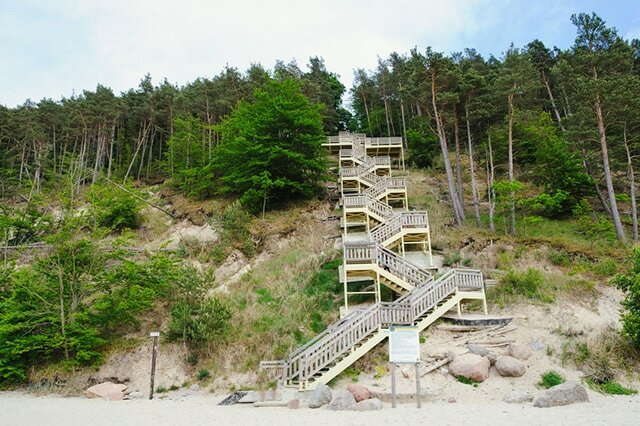 These beach steps take you from the heights of the forest to the beach below all while taking in the stunning views as you make the transition from land to water. 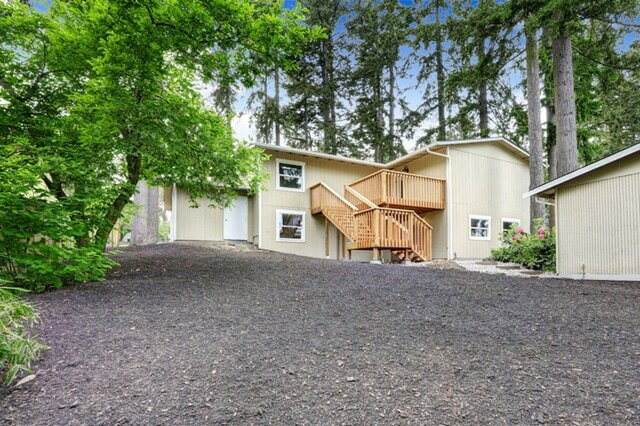 Make your way into the surrounding countryside with this dramatic deck and walk down from a second story. 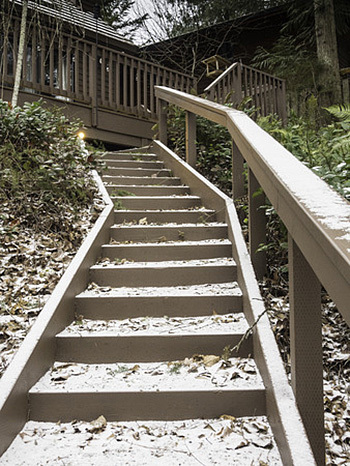 These stairs are curved to utilize the area next to and beneath the deck so as not to provide too steep a climb. Utilize the natural formations around you and take advantage of a hillside slope to build your walkway directly into the landscape. Providing perfect support, the ground beneath can act as your foundation for easy access to previously difficult to reach property. Anyone who lives near water knows that many properties may have the added challenge of beachside access. Avoid the terrain and build yourself a long walk up, complete with places to stop and rest and enjoy the view! Wood is such a versatile material since it can be used in rustic, raw manners, as well as polished up and stained in a more modern setting. 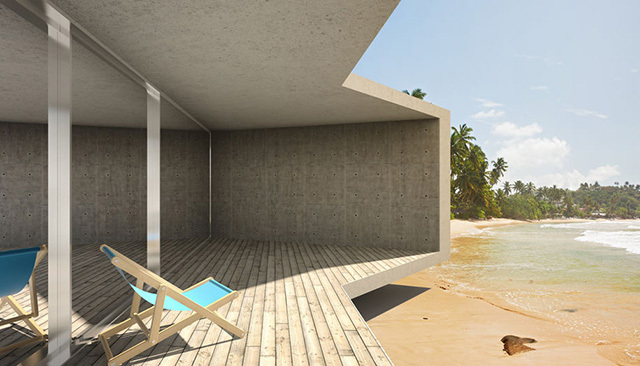 These simple wooden slabs are kept in their natural shape to provide an eclectic, simple access to the deck above. Take your steps away from the main deck and away from the traffic, you would expect when your deck is utilized as it should be. Stairways don’t have to be the main focus and can provide access in an elegant, yet non-overbearing way. Get creative with your handrails. Rich wood stains highlight the geometry of this stairway and railing combo to provide an artistic, appealing walk down. Smooth steps match the smooth grains it’s supported by. 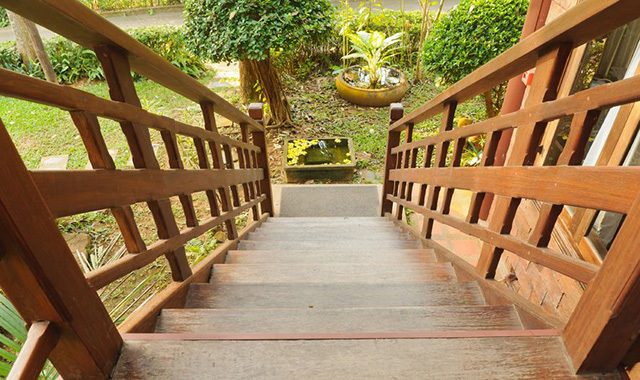 Stair depth can provide an easier accessibility as well as a unique look to your decking design. Rather than have a few short stairs leading down, instead extend your stairway by a few extra deep steps. 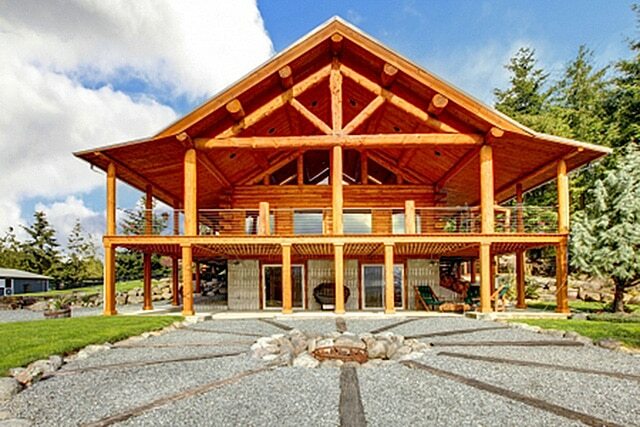 The beauty of wood is how it can easily morph into what you want and need. Wood stains aren’t all you can use on it’s surface. Bold paint on this wooden deck stands out against the house and vegetative landscape. Feel free to be uniquely you in your design ideas and color choices. Stairs to an upper housing level are highlighted against the decking extension that seemingly climbs the architectural exterior wall. Soft yellow pine stands as a bold contrast to modern concrete walls to soften the look and provide artistic expression. Often stairways are created from wide boards, but consider using narrow choices for a unique appeal and a more geometric linear look. Decks don’t need to be bland and boring and sometimes simple choices make all the difference. Welcome your guests with a leading entryway that opens up not only into a spacious, outdoor living area, but provides easy access to the home. This unique walkup takes full advantage of the space provided to create a warm, inviting atmosphere. 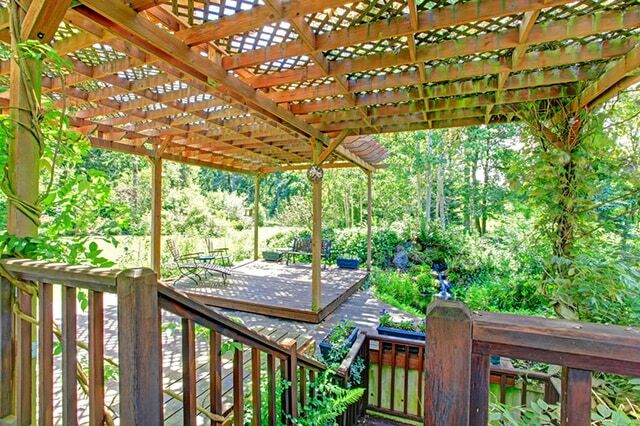 An arbor graces the steps to this deck, complete with flowering vines. 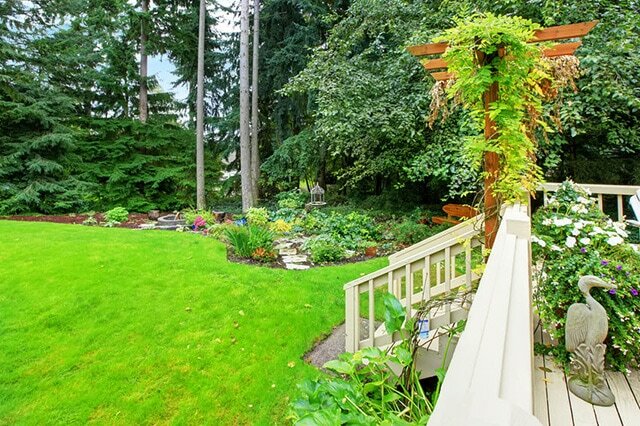 Enjoy your transition between yard and deck with graceful, and elegant vegetation. Rather than focusing on wood shape and stain color, pick the wood that has the cool, intricate grain patterns and leave it natural with only a protective stain, rather than a color that will lose this contrast. 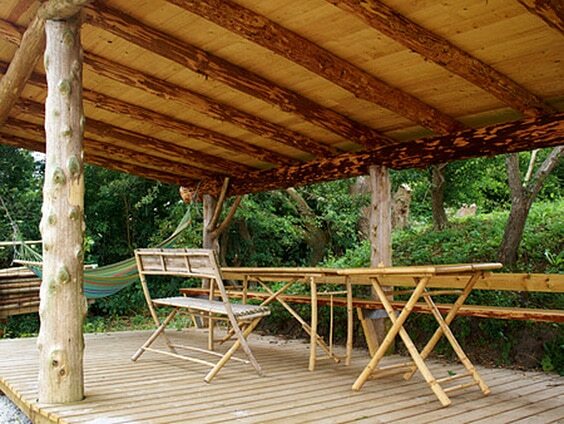 Many decks aren’t complete without a classic pergola- a wooden covering that provides both shade and some minimal protection from the elements. These are popular in areas that have intense sunlight to help keep you cooler, and able to better enjoy your evenings outdoors. Plus, they are also excellent for providing a degree of privacy. A narrow pergola covers the long seating area of side deck. Serving multiple purposes, this type of structure not only provides some elemental protection but also can be fitted with lighting for backyard ambiance once the sun goes down. This structure takes a more open and airy approach and incorporates a frosted protective surface that can let in filtered light, but also provides shelter from wet weather. 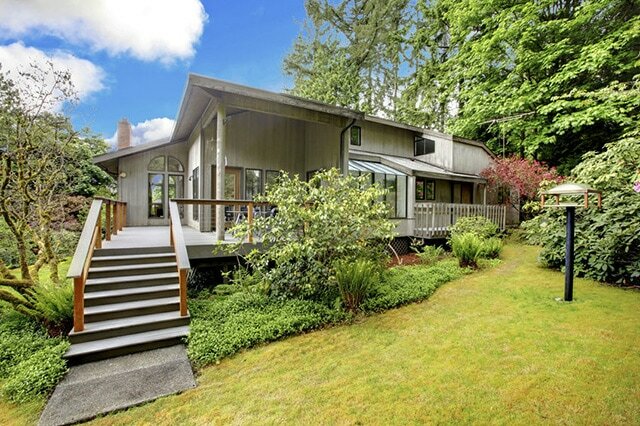 From here you can lounge in your outdoor living room during any season. 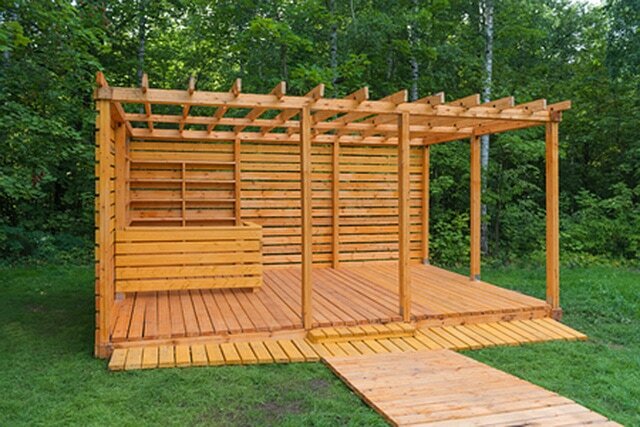 This fun little decking and pergola combo can be multi-purposeful and serve in a variety of events. 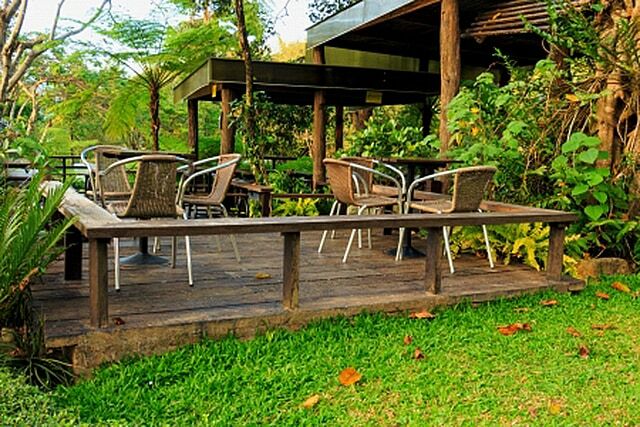 Use as a shade shelter, a retreat to relax, or even an area of entertainment. Outfit with a mini bar as this one has, and you have the perfect spot to entertain. Natural, unfinished logs create the frame for this nontraditional pergola covered with a roof to provide an outdoor retreat and eating area. Pergolas may be a more open-air design, in areas that receive a lot of moisture. Have fun creating what works well for your year round enjoyment. Pergolas are unique in that they lend a more contemporary air to architectural design but blend well into almost any sort of time period. This old farmhouse with a colonial inspiration is given an updated look with a beautifully designed pergola covered patio. The effects of this massive pergola is further intensified by the latticework that is used over it to cast shade, and intricately mottled shadows, over the decking and ponds found in this landscaping design. This fabulous wraparound porch is further brought to life by the long angles of multiple pergolas that extend out into the garden from the house. Your eye can’t help be drawn into the surrounding gardens for a truly unique design. Tiered pergolas and multiple seating areas define this deck as the perfect place to take your pick of areas to relax in. Natural post and colors help make the entire effect look as if it is growing out of the landscape itself to provide privacy and tranquility. 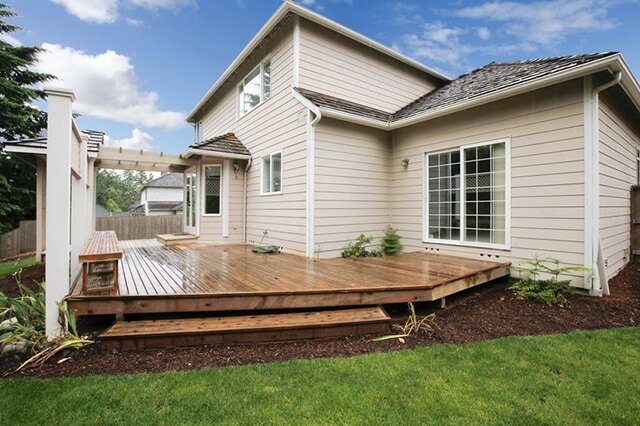 Adding a deck truly is the adding of an extension of your living area. Take advantage of the designs you’ve chosen to incorporate more than just a place to sit and relax or dine and socialize. 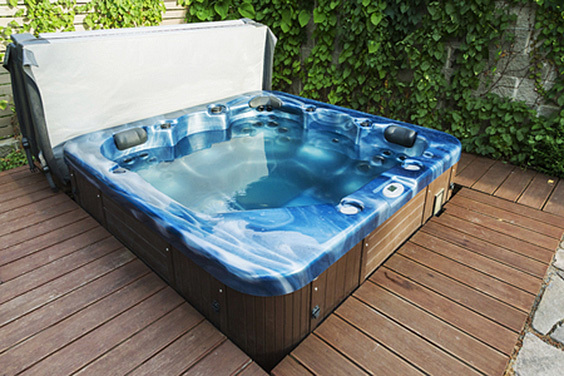 As mentioned previously gardens and even ponds can become a part of your deck experience, so why not pools and hot tubs? 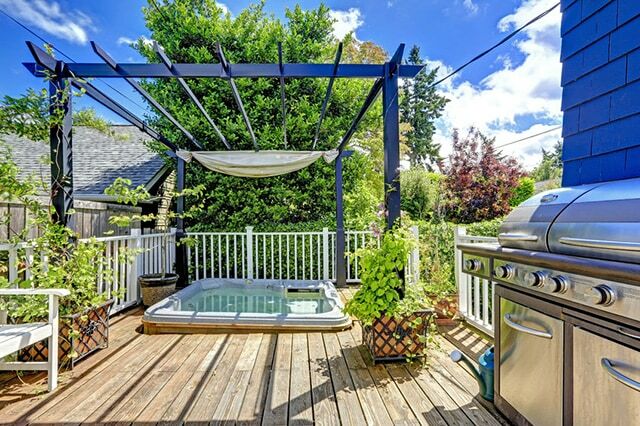 Private decking, a canopied pergola, and a jacuzzi- who could ask for more? 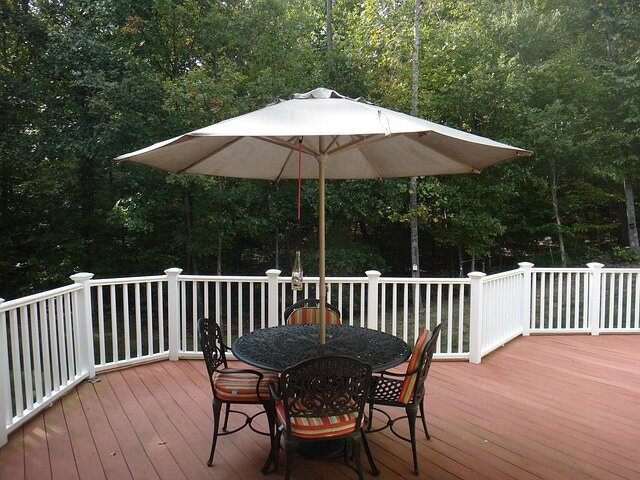 This small deck utilizes all it’s room with a small sitting and dining area and protective spa. Potted plants provide an easy visual transition to the surrounding vegetation as well as an illusion of more space. 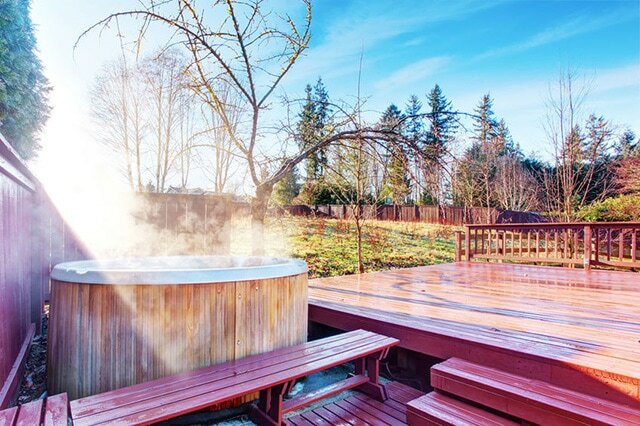 Building a deck specifically for your hot tub is not as strange as it sounds. Not only does it provide easier access it also keeps out dirt and debris that you may track in on your feet, as well as a place to put your personal items. 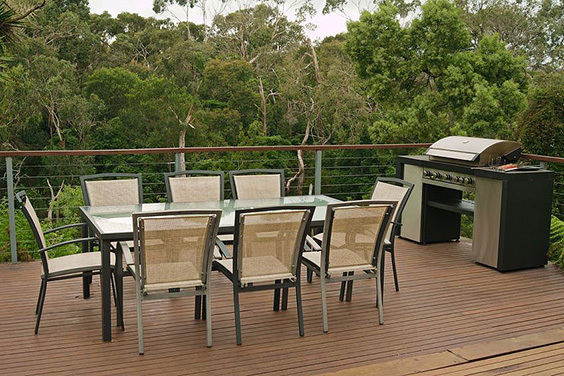 So many of the prior decking examples take in the surrounding views. Why not enjoy them from a relaxing spa with a glass of wine in hand? 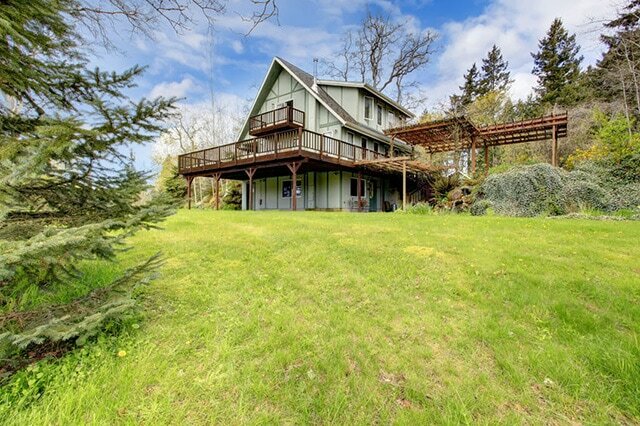 This design incorporates an overlooking lake vista with the perfect spot to enjoy from a raised deck, complete with hot tub. 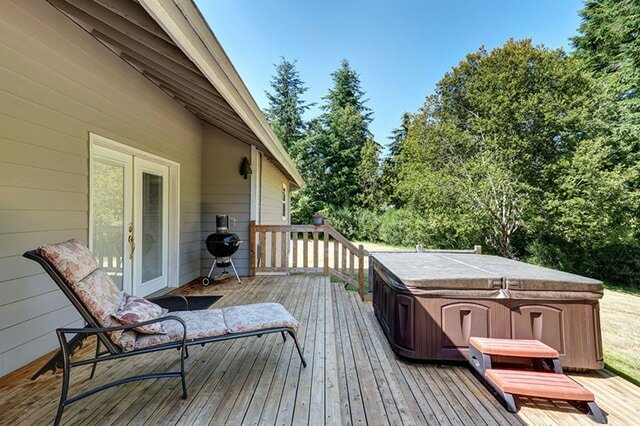 If you have an existing hot tub but want to add a deck, don’t worry about location. 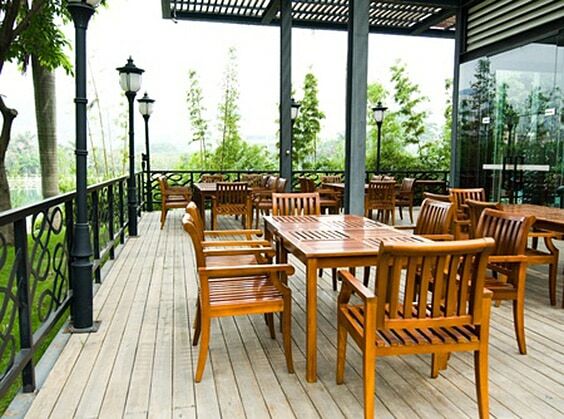 Instead, plan your decking design around it and incorporate it right into your deck itself. 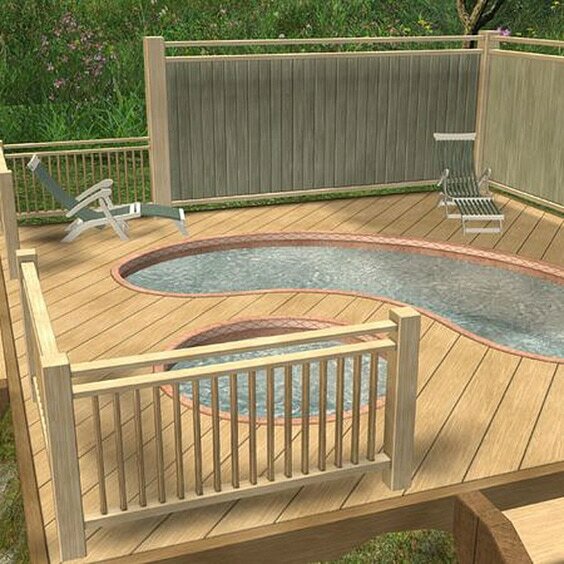 There are many hot tub designs to choose from in this day of age, so why not extend your decking materials to include the hot tub too? 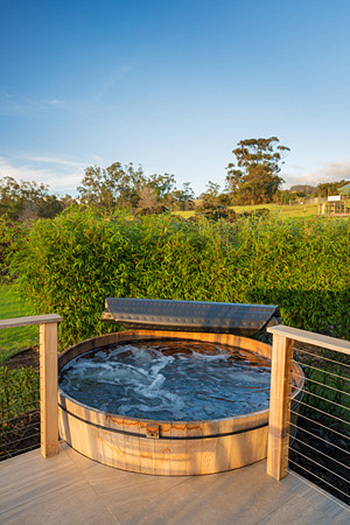 This beautiful rounded hot tub takes on the natural hues of the wooden deck and is situated to include the surrounding countryside. 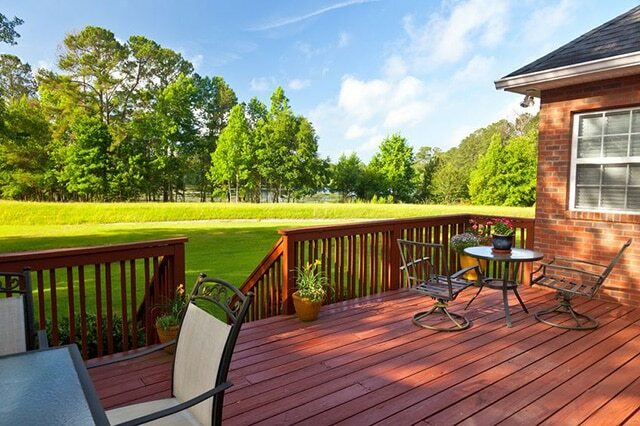 This deck leads right to where you want to be. Raised decking, stairs, and strategically placed benches make this hot tub an obvious focal point for some rest and relaxation- even on a chilly fall evening! 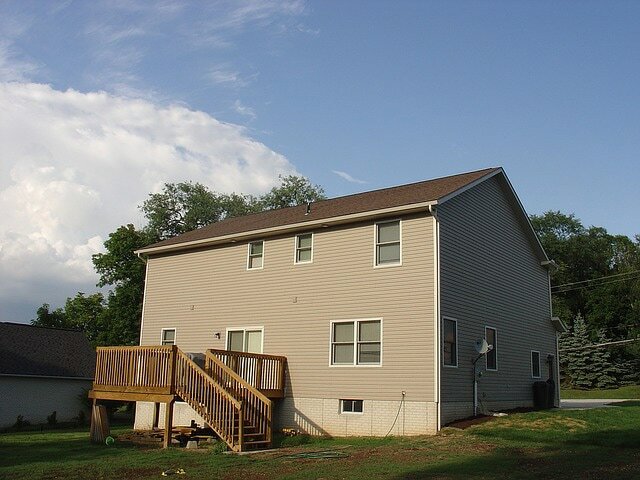 Have an existing deck? No problem! 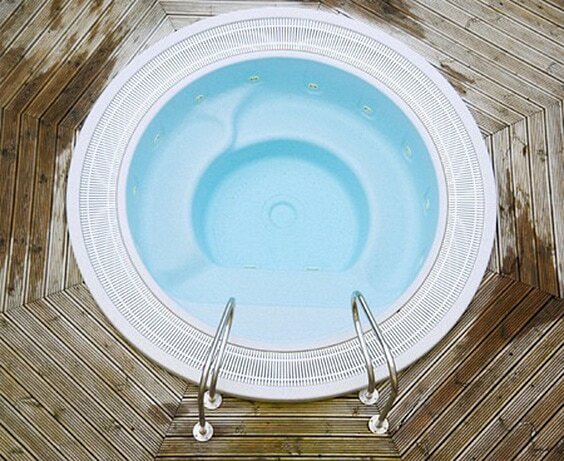 Even if you aren’t interested in placing your hot tub within the deck itself, you can still make it a part of your deck and pace it on top. This is actually a great way to keep too much moisture from accumulating underneath your hot tub and also allows for increased airflow and easier maintenance access when you aren’t dealing with tight spaces. Or you can take the approach to set your hot tub within the deck itself and create a deck that is not only supportive of your accessibility but serves as an aesthetic focal point. Don’t feel guilty if you want to build a lounging area specific only to your comfort. 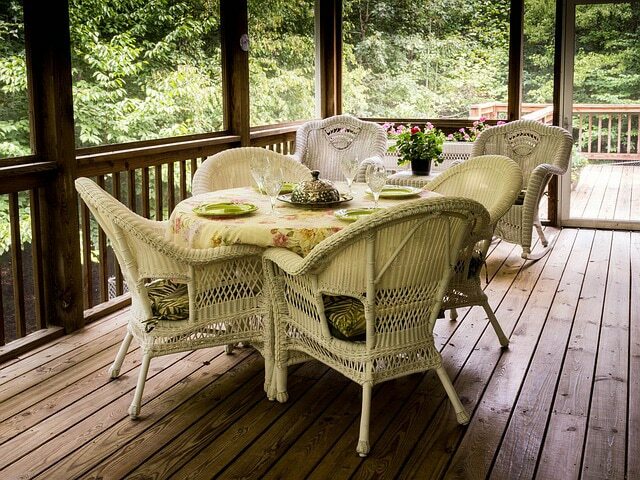 A deck doesn’t have to have enough space to dine upon, or even fill with company. 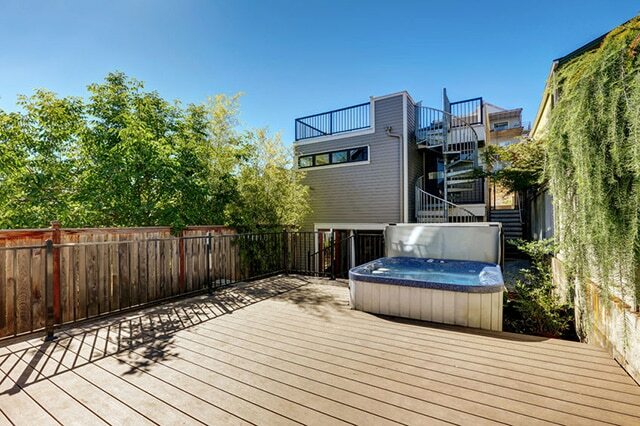 This deck is specific for sunning and relaxing in multi-temperature pools. 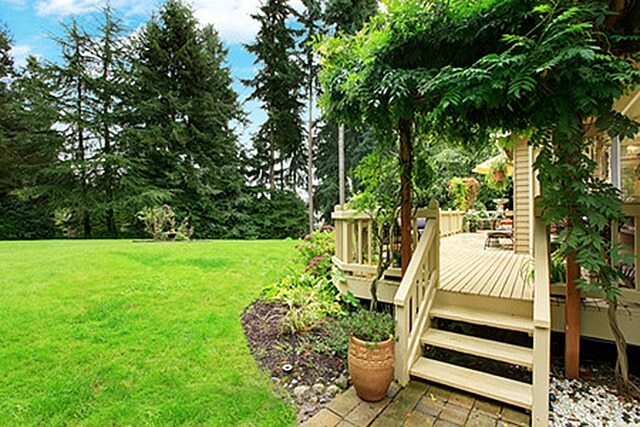 With all these wooden deck design ideas can you pick just one? 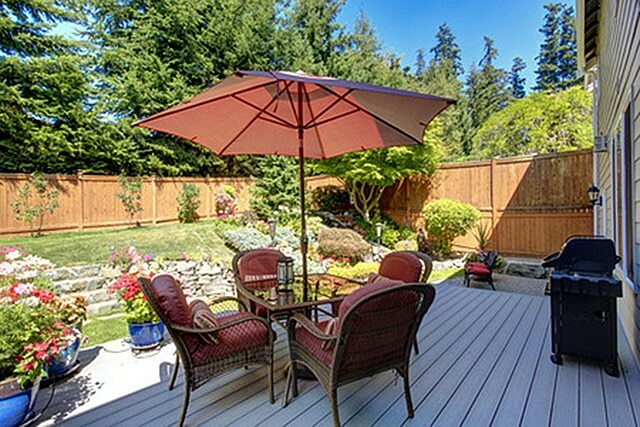 I’ll admit I have my favorites I would love to have one day, but much of your deck design will be determined by existing structures and landscape. Once you have a good idea of what you need, then get creative in what you want exactly to create the perfect haven to sit back and enjoy any time of day. Which is your favorite? Comment below and as always, please share if you love it! 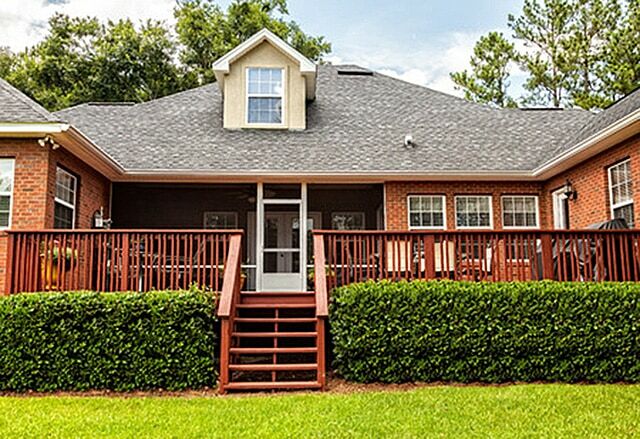 I’ve been wanting to build a new deck for my home and think it’s really important for it to look nice. These examples all look really neat and I think styles like #38 and #43 would work well. 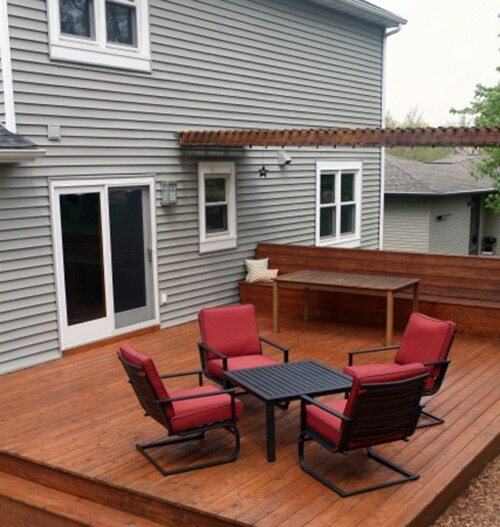 These design elements coupled with modern styles like slat fencing and dark colors could be a great way to have a nice looking deck for my family. So glad we provided some nice examples to browse through for you! I love to take a look at the many designs and styles available before picking and choosing my own style. Share your pictures with us when you get it done!